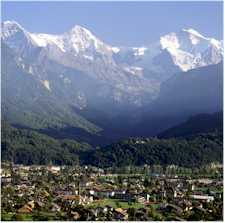 ABOVE: Interlaken and the Jungfrau Massif, as seen from a vantage point near Harder Kulm. Interlaken, Switzerland is often used as a tourists' base camp for excursions to the Jungfraujoch, the Schilthorn, Schynigge Platte, and other scenic places in the Jungfrau Region of the Bernese Oberland. Many of these excursions are expensive, and all require at least half a day's time. The scenic summit offers some of the most spectacular views in the remarkable Jungfrau Region: A bird's-eye view of Interlaken and the area nesting between Lake Brienz and Lake Thun. The two emerald-green lakes, surrounded by Alpine peaks. And the crowning glory--an uninterrupted view of the awe-inspiring peaks of the Eiger, M�nch, and Jungfrau. The Harder has lost none of its magical attraction since composer Felix Mendelssohn set the words of poet Eichendorff to music: "O magnificent forest, who planted you there, so high above?" Over 100 years ago, Mendelssohn reached the sumit by foot, through the same woods along the very same paths which are still in use today. Visitors can now take it a lot easier and make the trip to the top by nostalgic funicular railway. Folklore evenings take place on the Harder Kulm from time to time, and the children's playground is always open. The valley station of the Harder Kulm funicular is just across the river from central Interlaken and the Interlaken Ost railway station. From the H�heweg (Interlaken's main street), head for the Beaurivage-Br�cke and cross the bridge to the funicular. The funicular operates from late April through late October, with departures at 20- to 30-minute intervals from 8 or 9 a.m. until late evening, depending on the day of the week. The trip takes 10 minutes. If you wish, you can buy a one-way ticket and walk back to Interlaken via marked hiking paths. This English-language page at the Jungfrau site has a photo of the Harder Kulm restaurant, a view of the lake, and practical information. Our guide will help you plan a trip to the hub of the Bernese Oberland and its Alps. Photo Copyright © Switzerland Tourism. Used by permission.